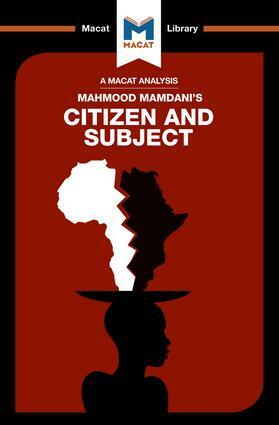 Mahmood Mamdani’s 1996 Citizen and Subject is a powerful work of analysis that lays bare the sources of the problems that plagued, and often still plague, African governments. Analysis is one of the broadest and most fundamental critical thinking skills, and involves understanding the structure and features of arguments. Mamdani’s strong analytical skills form the basis of an original investigation of the problems faced by the independent African governments in the wake of the collapse of the colonial regimes imposed by European powers such has Great Britain and France. It had long been clear that these newly-independent governments faced many problems – corruption, the imposition of anti-democratic rule, and many basic failures of day-to-day governance. They also tended to replicate many of the racially and ethnically prejudiced structures that were part of colonial rule. Mamdani analyses the many arguments about the sources of these problems, drawing out their hidden implications and assumptions in order to clear the way for his own creative new vision of the way to overcome the obstacles to democratization in Africa. A dense and brilliant analysis of the true nature of colonialism’s legacy in Africa, Mamdani’s book remains influential to this day.